Recently, I was contacted by Suncoast Products asking me to review a few of their natural nail products. As I have been curious about water-based polishes, I gladly said yes. Eye Candy - warm pink with golden shimmer. This polish is part of their "Girls" line which is marketed towards children 3 years and older. It is also a peelable nail polish, meaning that you can simply peel it to remove it rather than using a nail polish remover. I really liked the color on this. I think it would be perfect for a little girl. This one dried fast (though not as fast as Mulberry below) and it dried with a satin finish. 3 coats. 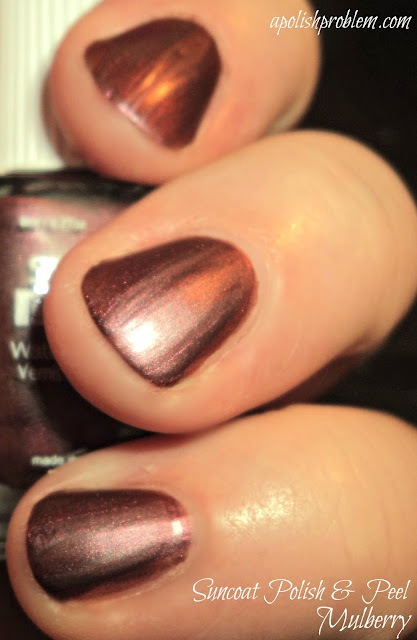 Mulberry - deep, browned plum shimmer. 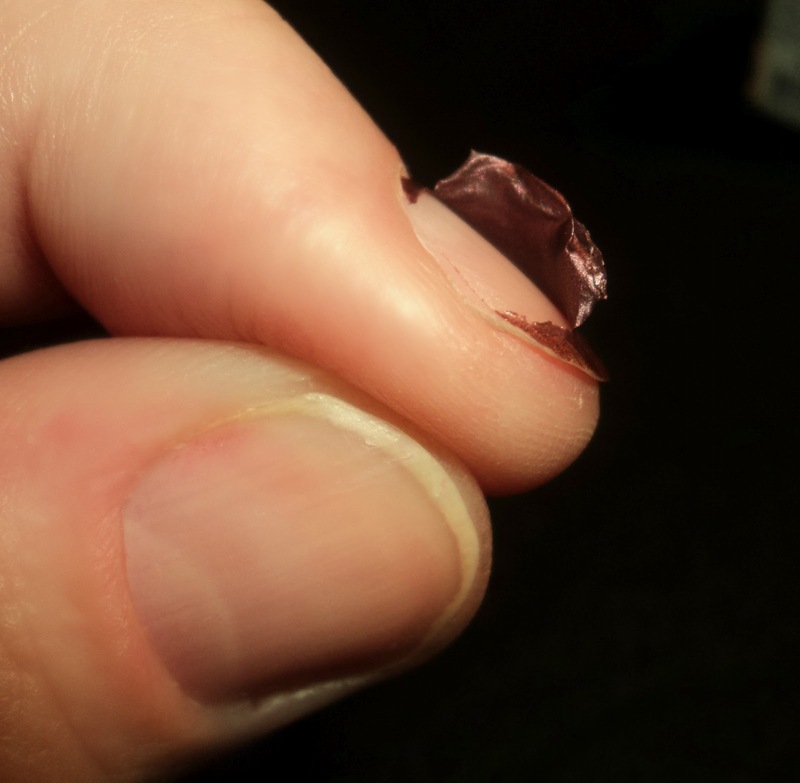 Like Eye Candy, this is another peelable nail polish. The color itself is a brown/purple hybrid that would look nice in cooler weather. Because it's a peelable polish, it does dry matte. You can, of course, add topcoat to it, but I'm not sure if that would still be peelable after adding a topcoat. I did have to use 3 coats to reach opacity, but it they dry super fast. All 3 coats were dry in about 7 minutes. 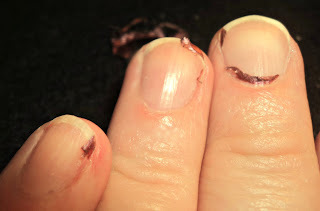 This is what my nails looked like after I had peeled off the polish. I still had bits of polish around the edges of my nails, but that was easily removed with a swipe of remover. 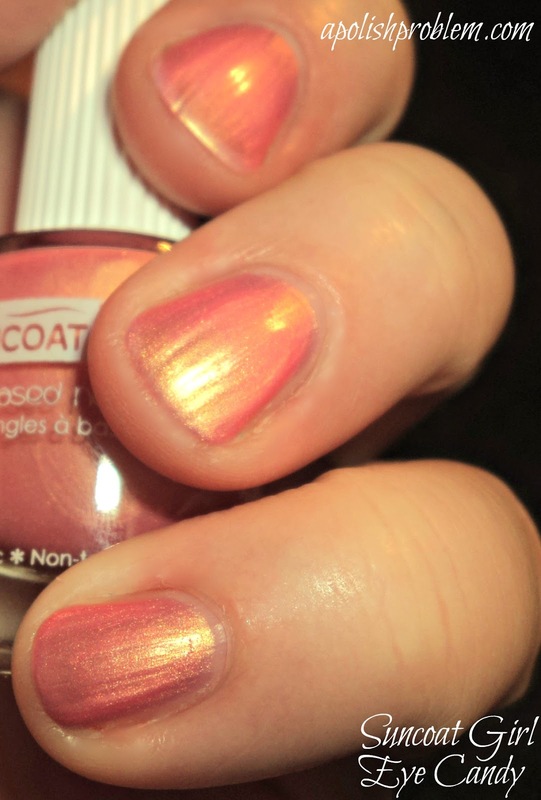 In reviewing this polishes, I completely realize that I am not in Suncoat's target demographic. I am not a "natural products" person, and I will pretty much put whatever on my nails. LOL. However, I realize that many people would be interested in this product, that's why, rather than comparing these to traditional nail polishes (which isn't a fair comparison), I approached this review from a different direction. They are different, yes. That said, if you are someone that doesn't want to put all of the chemicals found in traditional nail polish on your nails or your child's nails, these polishes are a good option. Per Suncoat's website, 60-70% of these polishes is made up of water, with the other 30-40% being synthetic polymers that create a film over your nails. I, personally, would not use these for everyday use. However, if I had to be somewhere and quickly needed to put some colors on my nails, because of the fast drying time, these would be a good choice. I don't think they would last more than a day on my nails, but that really doesn't bother me because I change my polish so frequently. If your nails hold polish better than mine, they may last much longer on you. Suncoat Polish & Peel polishes are available on their website and Suncoat Girl polishes can be found at suncoatgirl.com. Mulberry retails for $8.99 and Eye Candy retails for $7.99 with each being an 0.27 fl oz bottle. These products were sent to me for review. The above links are links to websites for these products and are not affiliate links. really pretty colors! not sure how much i am into peel off polishes bc i would not be able to resist peeling them off immediately! Polish and Peel? This totally reminds me of that Austin Powers character Goldmeber-- "Oh, that'sh a nishe one. Shave me from myshelf!" I really like polishes that remove easily. aww man, I think that I would pick it off :p I KNOW I would if I was a little kid.